Land Districts (formerly counties), subdivided into parishes, and formerly with hundreds. Lands administrative divisions of Australia refers to the parts of Australia which are divided into the cadastral units of counties, parishes, hundreds, and other divisions for the purposes of land ownership. Many property titles in Australia are listed as being in the parish and county. Counties in Australia have no administrative or political function, unlike those in England and the United States. Australia instead uses Local Government Areas, including shires, districts, councils and municipalities according to the state, as the second level subdivision. Some other states were also divided into Land divisions and land districts; in the nineteenth century land districts sometimes served as the region name the parts of the state where counties had not been proclaimed yet. Below these are groups of land parcels known as Deposited Plans, Registered Plans or Title Plans (depending on the state). Queensland has Registered Plans; New South Wales and Western Australia have Deposited Plans; while Victoria has Certified Plans. Land can be identified using the number of this plan of subdivision held with the lands department, rather than with a named unit such as a parish (or both can be used); it is becoming increasingly common to use only the plan number. Within these are individual land parcels such as lots; in total there are estimated to be about 10.2 million of these in Australia. The various cadastral units appear on Certificates of Title, which are given Volume and Folio numbers; these numbers by themselves are sometimes used to identify land parcels, or in combination with the other units. Detailed maps of these divisions have been required since the introduction of the Torrens title system of a central register of land holdings in South Australia in 1858, which spread to the other colonies. While cadastral data since the 1980s has been digitalised, there remain many old maps showing these divisions held in collections of Australian libraries such as the National Library of Australia, as well as in state libraries. Counties were used since the earliest British settlement in Australia, with the County of Cumberland proclaimed by Captain Phillip on June 4, 1788. In 1804 Governor King divided Van Diemen's Land into two counties; Buckingham in the south and Cornwall in the north. The parishes date to the surveys conducted after 1825, with the instructions given to Governor Brisbane on 23 Jun 1825 to divide the colony into counties, hundreds and parishes. At this time there were five counties already proclaimed in New South Wales: Cumberland, Westmoreland, Camden, Argyle and Northumberland. The Nineteen Counties in south eastern New South Wales were the limits of location of the colony in a period after 1829, with the area outside them originally divided into districts, and later also into counties and parishes. Counties were established soon after the foundation of other Australian colonies. The use of counties, hundreds and parishes was popular in Australia in the 19th century, with many maps of Australian colonies showing these divisions, and towns and cities often listed in their county. Legal cases referenced counties , and many genealogical records for Australia in the 19th century list the county and parish for location of birth, deaths and marriages   . The 1911 Britannica also describes Australian towns and cities as being in their respective county, including most of the capital cities: Melbourne, County of Bourke ; Sydney, County of Cumberland ;Brisbane, County of Stanley ; Adelaide, County of Adelaide; and Hobart, County of Buckingham . However it is not mentioned that Perth was located in the County of Perth, as even by this time county names were infrequently used in Western Australia, where they did not cover all of the settled areas, unlike the other states. Instead the system of land divisions and land districts was used, with most of Perth located in the land districts of Swan, Canning and Cockburn Sound, all in the South West Division of Western Australia. Darwin is located in the Hundred of Bagot in the County of Palmerston: usually only the hundred name, not the county, is mentioned. This is divided into sections. An example of the way locations are described for Darwin is Darwin Airport listed as being in "Section 3381, Hundred of Bagot from plan LT089/067A"  In Alice Springs, where there are no hundreds or counties, legal documents give the lot number, town and plan number, for example "Lot 8721 Town of Alice Springs, plan(s) LTO96/016"
There are 49 counties in South Australia, mostly in the south-east part of the state. The counties are divided into 526 hundreds. Adelaide is located in the Hundred of Adelaide in the County of Adelaide. The County of Adelaide between 1855 and 1921 held at least 60% of South Australia's population; the figure rose to 70.6% in 1966. All of the counties had been proclaimed by 1900, except for Le Hunte (proclaimed 1908), Bosanquet (proclaimed 1913), and Hore-Ruthven (proclaimed 1933). Parcels of land in most residential areas are identified with the Deposited Plan or Filed Plan number with an allotment number, for example "Allotment 20 in Deposited Plan (DP) 11270". In many rural areas and historically in residential areas, land is described with the Section number, Hundred and County, for example "Section 53, Hundred of Borda, County of Carnarvon", or the allotment number within government towns. Sometimes a combination is used, such as "allotment 1 (DP 25326), Hundred of Munno Para"  Often only the Hundred name is used, not the County, as each Hundred has a unique name making the county name redundant. At the start of the 20th century, Western Australia had six Land Divisions which cover the whole state, divided into 80 Land Districts. The land districts were further subdivided into locations and lots. 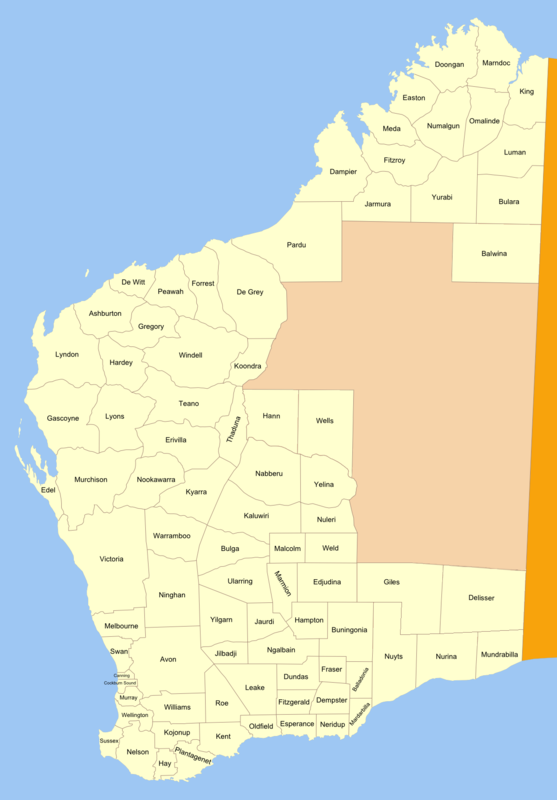 Western Australia also had 26 counties, all located in the south-west corner of the state, around Perth. The counties were designated in 1829, the year of the foundation of the Swan River Colony, with Governor Stirling instructing that counties were to be approximately 40 miles square (1600 square miles). The counties appear on some nineteenth century maps of Australia along with counties in other states , however it was the land districts which were used for cadastral purposes, and were the equivalent of the counties used in the eastern states. Around the end of the twentieth century, legal documents usually wrote them in the order: Land District, Location, number. For example: "Swan Location 2301". These are further divided into lots. More recently, Western Australia uses only the Lot and Deposited Plan numbers, such as "Lot 853 on Deposited Plan 222626". ^ Australasia 1882 Society for Promoting Christian Knowledge (Great Britain). Committee of General Literature and Education. NLA MAP RM 941. This page uses content from the English language Wikipedia. The original content was at Lands administrative divisions of Australia. The list of authors can be seen in the page history. As with this Familypedia wiki, the content of Wikipedia is available under the Creative Commons License.